Put the potatoes into a saucepan and cover with water. Bring to the boil, then reduce the heat and simmer for three to five minutes until the potatoes are just cooked. Remove from the heat and drain. Layer the slices of potato with the tomato and onion in a greased ovenproof dish. Sprinkle the bacon in between as you layer. Melt the butter and stir in the garlic. Pour over the vegetables. Add the sprigs of thyme. Bake in a preheated oven for 25 minutes. Cut one or two diagonal slits across each fish steak. 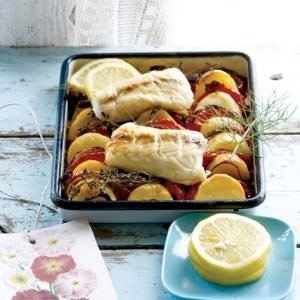 Remove the vegetables from the oven and put the pieces of fish on top of the vegetables. Drizzle with a little olive oil and a squeeze of lemon. Bake for a further 15 to 20 minutes or until the fish is done. Serve immediately.